The newly framed silk print from Longpr? 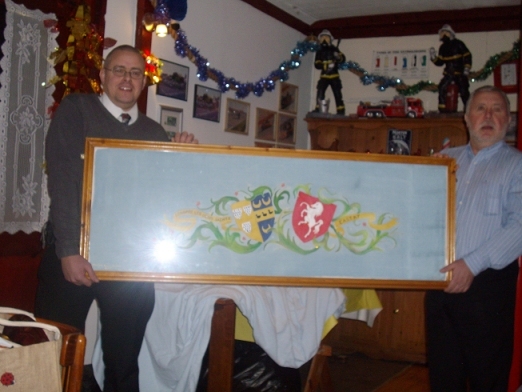 Cyril Marsh and Terry James display the silk print given to Eastry during the trip to Longpr?in 2007. The print was first 'stretched' and then mounted and finally Cyril and Terry made the frame so that the silk would be protected and available for display (currently in Eastry CoE Primary School). ETA Committee Meeting at The Five Bells, 3/9/08. In the saloon bar (previously the public bar) of the newly refurbished Five Bells. 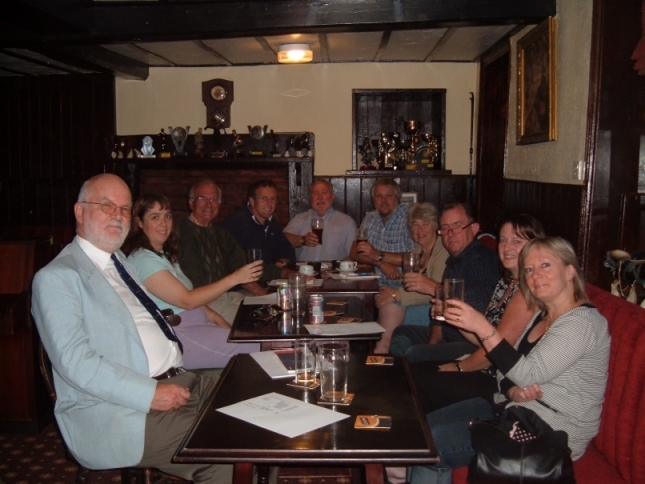 From left to right: Bill Clague (Treasurer), Pauline Marsh, Robin Goldup (Membership), Nick Kenton (Chairman, Eastry Parish Council), Terry James (Chairman), Nick Smith (Vice-Chairman), Peta Goldup (Secretary), Phil Smith, Wendy Smith (Vice-Secretary), Teresa Lane. Melanie Caldwell receives the David Skinner award. 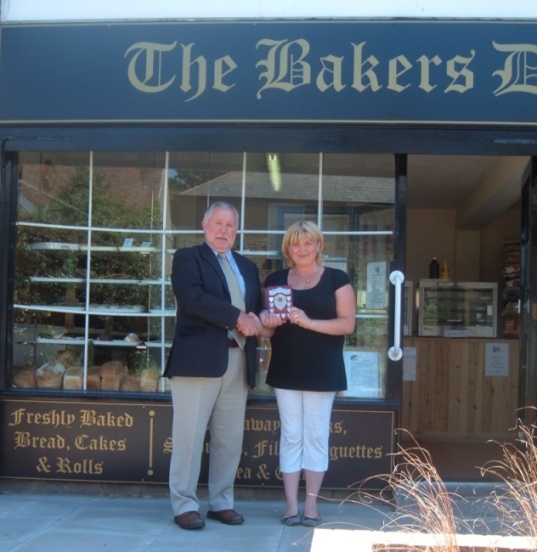 Terry James presents Melanie Caldwell of The Baker's Dozen the David Skinner award, given every two years to the the business with the best decorated window during the visit of the twin village of Longpr?les-Corps-Saints. Planting 'The Rose of Picardy' 6/8/08. 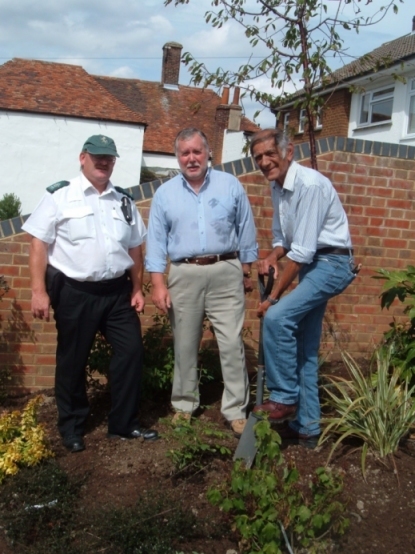 The picture shows ?from left to right ?Bob Priestley (Parish Warden), Terry James (Chairman of Eastry Twinning Association) and Sam Shevde (Vice-Chairman of Eastry Parish Council) planting a rose bush in the Millennium Garden at The Parade, Eastry. The rose, a Rose of Picardy, had been presented to Eastry Twinning Association by the comit?de jumelage of Longpr?les-Corps-Saints, Eastry’s twinned village ? which is conveniently in Picardy, France.